Have you ever wanted a Turkish carpet? Not one from a big box store near your house, but a real one - authentic, made by hand with such skill? When I was in Turkey last spring, we had the opportunity to visit a Turkish carpet workshop. I had no idea what to expect - but what I found surprised me, for here was a shop of craftswomen, working hard; patterns that were more complicated than I'd even contemplate in a coloring book; beautifully spun wool and silk; knowledge passed from mother to daughter through thousands of years. In the small town of Selcuk, near Ephesus and Kusadasi, you'll find a dusty square. Along one side of the square is a large stone building (complete with evil eye). This is Barok Authentic Looms - a part of the government-approved weaving guild. Here, they train weavers - and also have many weavers there who create extraordinary art. There are several rooms to explore, and completed rugs lining the hallways, walls, and floors. We learned about silkworms, and spinning the threads. We saw rugs in process - the women have the design right in front of them, and then work, row by row, on the carpet. The more difficult the design, the older and more skilled the woman weaving the carpet. 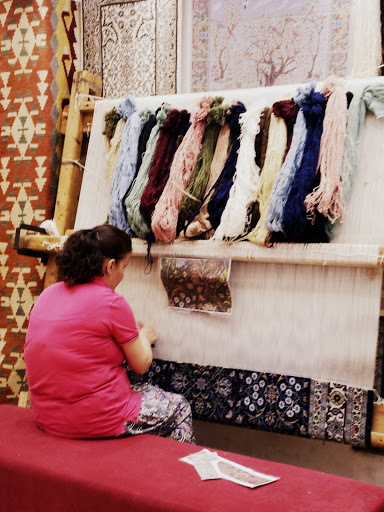 Did you know that Turkish carpets are made from both knots and flat weaves? For knotted carpets, the more dense the knots, the finer the carpet (and skill). At Barok, the dyes are all natural, gathered from the region. The dyes are made from plants, colored rocks and earth, and shellfish and insects. Carpet designs vary by region. The carpets are woven and knotted from the bottom up. They are finished at each end with a kilim weaving, to hold it tight. The weavers cut the knot threads during the weaving; afterward, they use special scissors to make more close cuts, so the carpet lies flat. 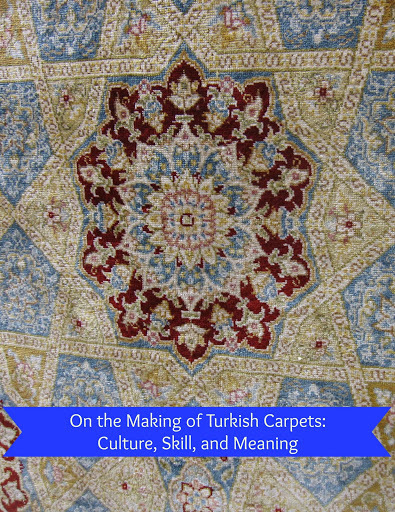 The patterns used in Turkish carpets have meanings and beliefs - from running water (my favorite) to wolf's mouth (used to protect against wolves, a concern for nomadic peoples) to the tree of life. These meanings, woven into the carpets, are a rhyming poem. No two carpets are the same. The messages of the designs present a living history of the region, as well as cultural details and wishes and protections. While others in our group headed to the carpet showroom, I needed a place to sit and rest. 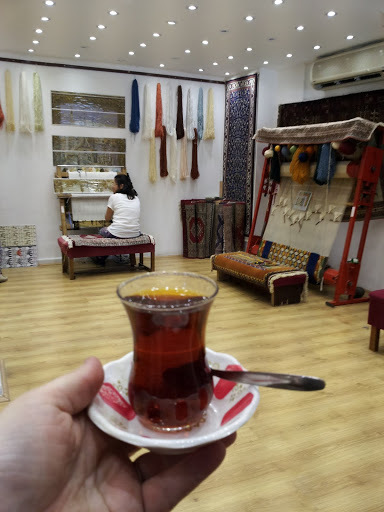 I went back into the weaving room, and sat down and drank my Turkish tea. I noted Ataturk's photo (seeneverywhere in Turkey), as well as some framed carpets from long ago. The women sat and wove, took breaks with their cellphones, stretched, and chatted. It was refreshing, calm, peaceful - and the women's work of ages soaked into the atmosphere, tinging it with purpose, survival, craftsmanship, and beauty.